Kimchi is really a fascinating thing. Someone who has never tasted it can easily be overcome by the pungent aroma that kimchi gives out. That pungent aroma is a blend of fermenting cabbage, garlic, ginger and lots of chile peppers. To anyone who has even once truly enjoyed kimchi, and realized how to eat kimchi, that aroma is really what excites the palate, but if you just go by the nose, it is sensory overload. 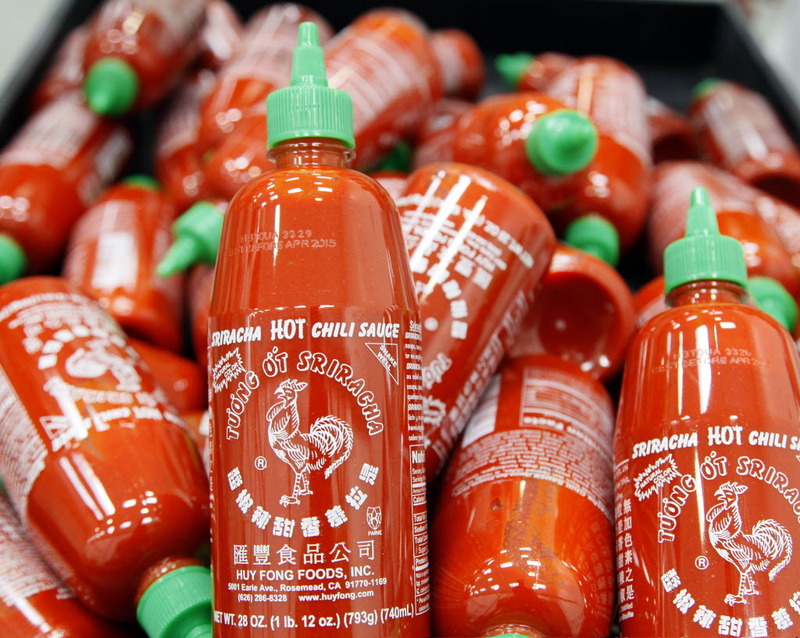 It magnificently breaks up oily and dense flavors, cutting right through it with a little bit sourness, a little bit of saltiness, a little bit of spice and a tad of sweetness. It’s the ultimate partner to carb sources — and while I personally refuse to do it, I know people, even family members, who require kimchi with pizza. But if you think about it, between the doughiness in the crust, the overwhelming amount of cheese and meat on the pizza, kimchi actually makes a great partner. There is virtually no Korean household that doesn’t have kimchi in the fridge. 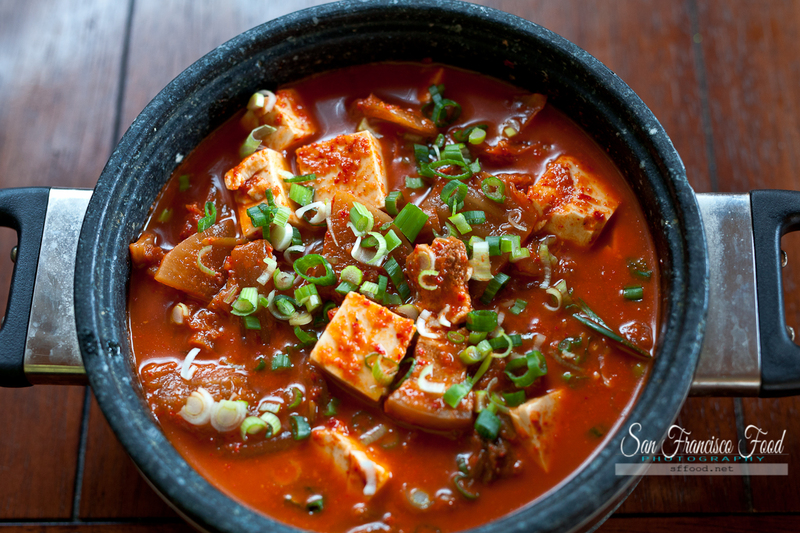 In Korea, there are restaurants that are known SOLELY for their kimchi. 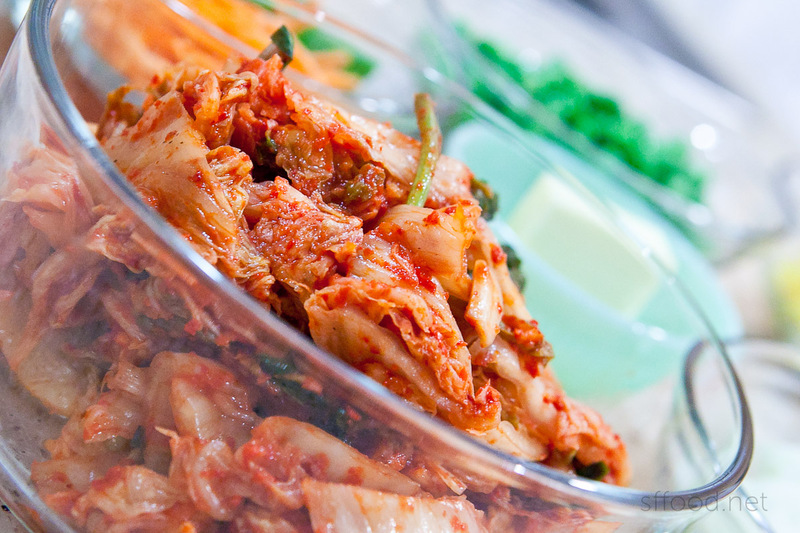 Depending on the region, some areas’ kimchi is spicier, sweeter, saltier, or completely white, or made as a cold picked white kimchi completely free of pepper flakes. There are dishes we make when it begins to sour, there are dishes we make when it’s fresh. Growing up, as a Korean child acquires the taste of kimchi and the tolerance for spiciness, kimchi fried rice inevitably becomes one of the children’s favorite treats. 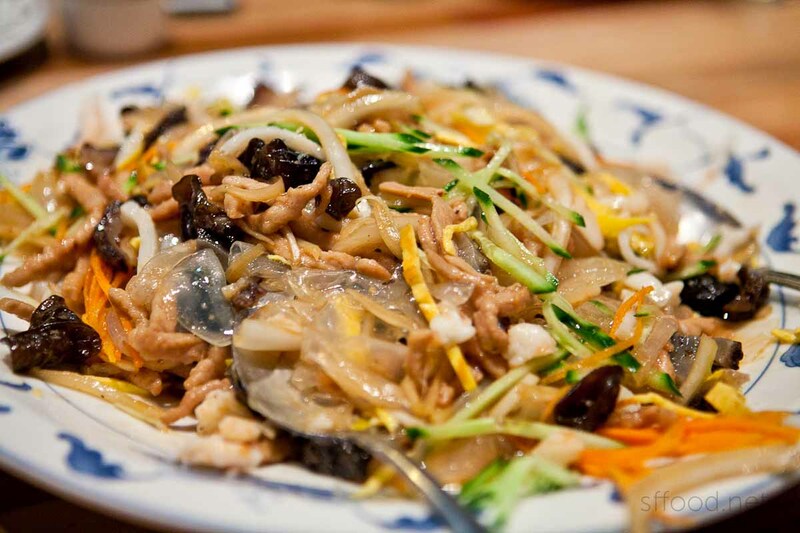 Unlike some other dishes, it’s easy and quick to make at home, so us parents don’t mind when kids request this, unlike some other favorites like black bean sauce noodles, which requires a little more planning to cook at home. This affinity for kimchi fried rice extends well into adulthood. It also spans across many cultures that grow up with it. Slap a sunny side up egg on top and you’ve basically made a classic. With kimchi as popular as it is in Hawaii, I wasn’t surprised by how excited Mr. K, who is from Hawaii, became when I suggested kimchi fried rice for dinner. The fact of the matter is that while I’m the Korean, Mr. K actually likes, thinks of and ultimately enjoys kimchi more than I do. And ultimately, I suggested it because it’s just about the easiest thing to make. In fact, it’s so easy that it’s about the last thing I’d order off of a menu when I’m at a restaurant. It’s a dish I always will make at home. What you see above is what I had in the house. 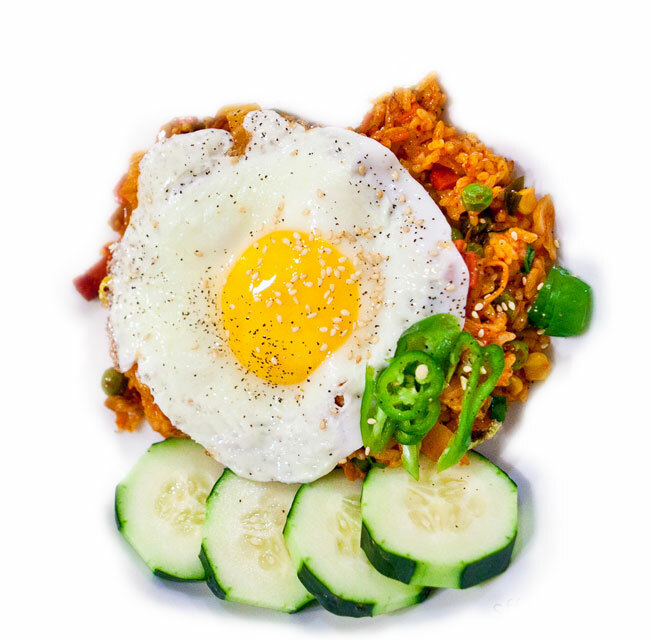 Kimchi fried rice is not the kind of dish that warrants a trip to the grocery store. 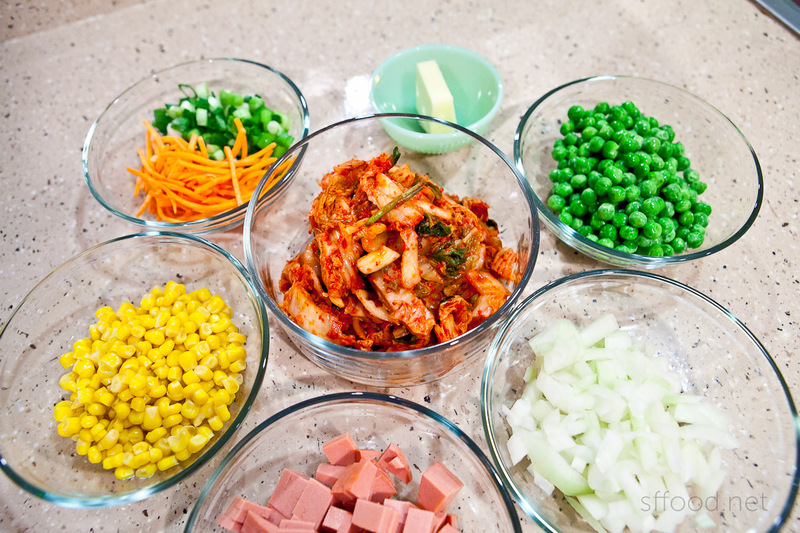 So long as you have kimchi, the ingredients list basically consists of whatever you have in the house. You don’t need to add meat, though I usually do, and all of the vegetables you see are not necessarily required. If you have nothing but kimchi, you can follow along with this kimchi fried rice recipe by excluding everything else. The key to good kimchi fried rice is having good kimchi. First and ideally, your kimchi is well-fermented. You can do this with fresh kimchi, but that slight sourness of kimchi really makes for a great fried rice, or else it’s a bit like frying fresh cabbage with some spices. 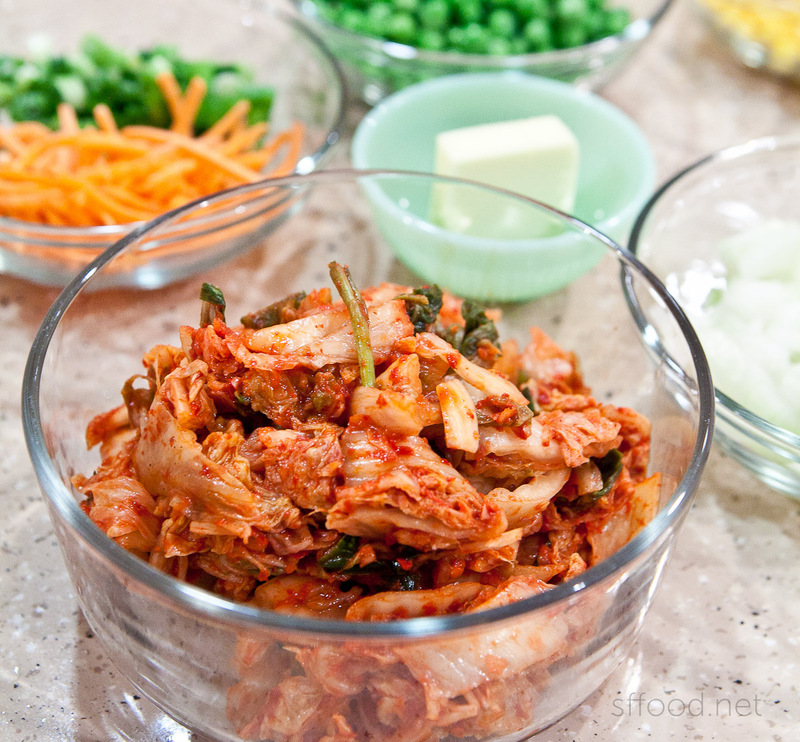 Try to keep the kimchi for a couple of weeks in the fridge, or at least 3 days in room temperature, to get the kimchi at an ideal state. For most of us Koreans, since we’re always storing kimchi in the fridge, it’s inevitable that we’ll end up with sour kimchi at some point, which is when this dish comes to mind. 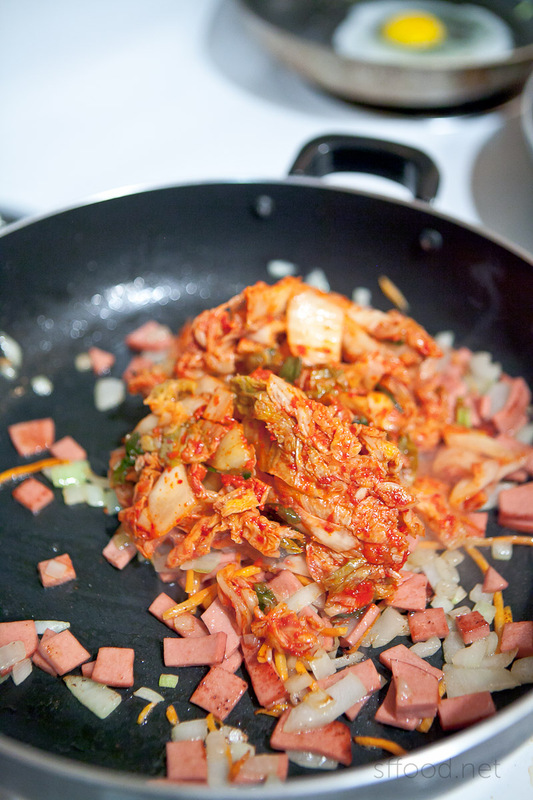 I slice the kimchi into thin pieces. It cooks better that way, looks better without the huge chunks of cabbage, and extends its color to the fried rice more generously. As mentioned, you don’t actually need a meat source. 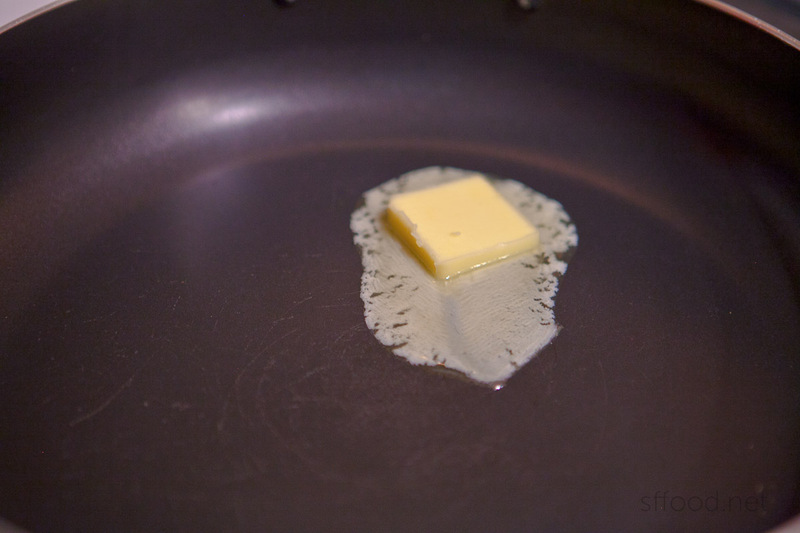 We’ll be using butter below, so it’s not an essential ingredient. However, it goes without saying that the addition of meat makes it that much better. Typically, I’ll bust open a can of SPAM — yes, SPAM! — but the other day, something possessed me and I grabbed a package of “thick-cut” bologna off the shelves at the store. I had two pieces, and then decided I don’t really like bologna, so it was sitting in the fridge doing nothing. I took out all of the slices (4 slices) and sliced into squares. So, for today’s recipe — here is the ingredient list, all but the kimchi, butter and seasonings being optional. I’m using a teflon pan today because this particular fried rice tends to stick to the pan towards the end. Some will say that the original kimchi fried rice would not have butter — and some would be right. But the original people cooking kimchi fried rice didn’t have butter — and I do, so…butter, it is. The combination of butter and kimchi is incomparably delicious — remember how I was telling you how kimchi pairs with fattiness? So butter, it is. Onions go into the pan. If you have garlic on hand, which — unbelievably enough — I did not, it would go in right now, too. Keep it on high heat and continue stirring to keep them from burning. I used carrots on this day because I happened to have some leftover from a dish I made the other night. 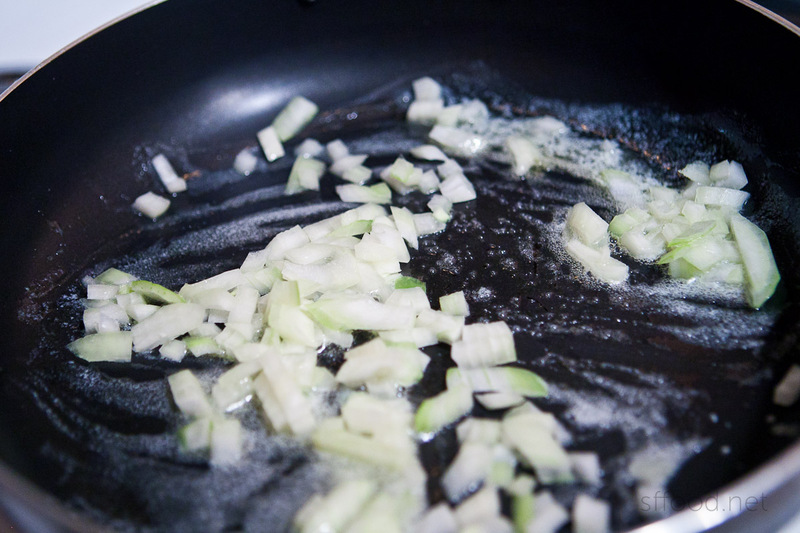 Since they need to cook, if you’re using them, toss them in a little after the onions begin cooking. Season all of it with a little bit of salt, keeping in mind your meat may have salt, and the kimchi on its own also has a lot of salt. 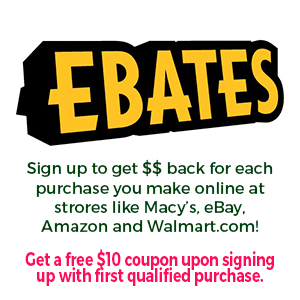 Be it SPAM, ground beef, pork slices or what have you — begin cooking the meat in the pan now. 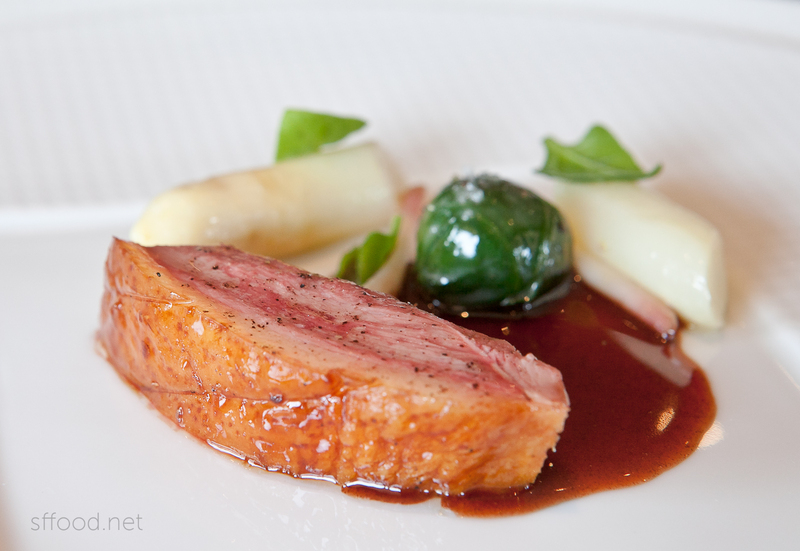 If you’re using raw meat, then make sure to cook it through thoroughly at this stage. Once the cold kimchi and rice goes in, it’s much harder to ensure that the meat cooks through. I don’t really know exactly how much kimchi I had in that bowl, but the entire amount was used. 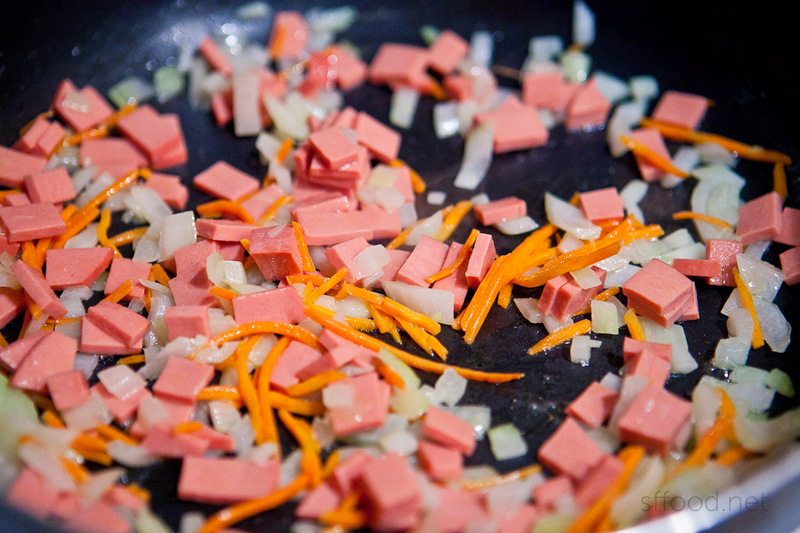 Drop it into the pan once the meat starts browning a little — you can see the bologna is nicely done at this point. The kimchi I have on hand right now really doesn’t have a lot of kimchi liquid/juice in the huge jar, otherwise you would see a lot more juice in this photo. If you can’t handle spice, you can actually wash off a little bit of the spice first — but keep in mind the end result won’t be as “red” which is sort of key for kimchi fried rice. If you’re going to use a fried egg, start the egg now. Cook the kimchi for 3-5 minutes, stirring and preventing it from browning but you will begin to see the kimchi look more translucent. Then, toss in whatever remaining ingredients you’re using. 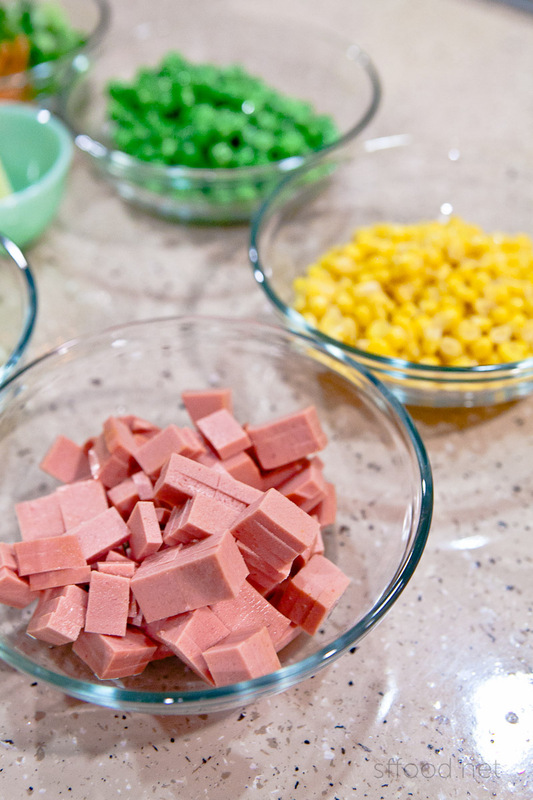 Here, the peas and corn provide extra sweetness to the dish and a slightly different texture. If you don’t have anything else — you can move on to the next step. In volume, you should end up with equal parts rice to the ingredients in the pan. This was a dinner serving as the main course for three people, to give you a frame of reference. That said, very few things store as nicely in the refrigerator as kimchi fried rice, easily enjoyed the next day. In this case, I’m using typical sticky white rice that is most common in Korean and Japanese cooking. In theory, you can use jasmine rice or long grain rice, more prevalent in Chinese cooking — but it’s just not the same. The richness of sticky rice is what makes this a savory dish, having enough weight and starchiness to balance out everything else you’re putting in. The lightness of long-grain rice would not really be a great substitute in my mind — but if that’s what you have, there’s really no real reason not to use it. 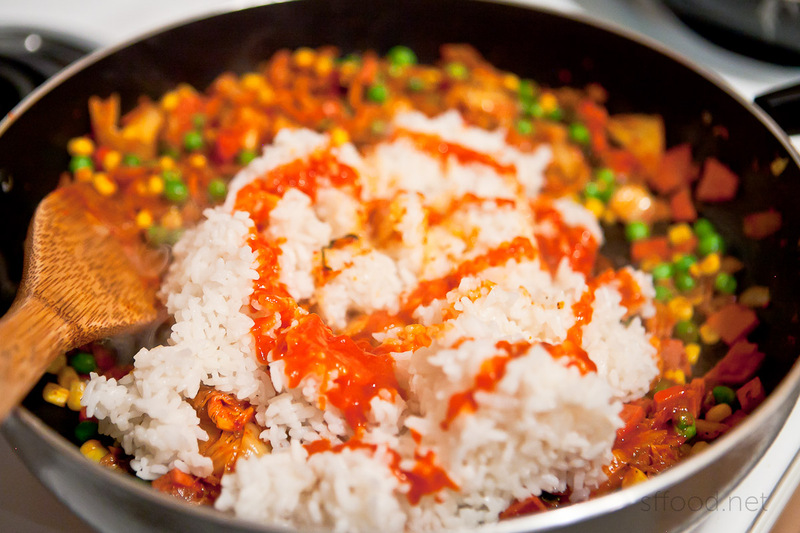 On top of the rice, I just drizzle some Sriracha sauce. If you don’t know what that is (what rock have you been under all of this time? 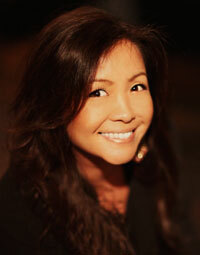 ), here’s a photo for you. 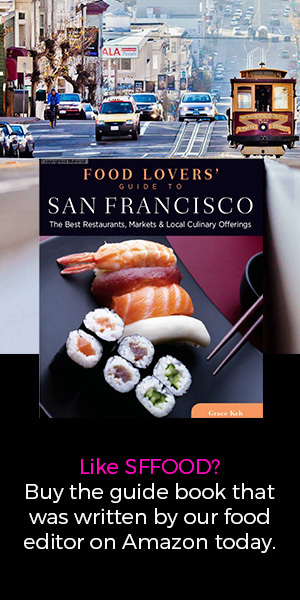 :) It’s available at virtually every supermarket in large cities, and every single Asian market in the country, I would guess. 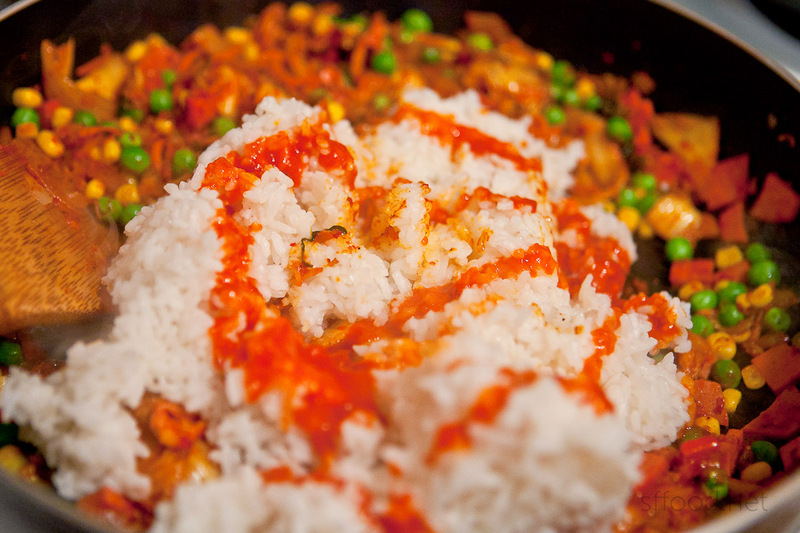 Now, you spend some time breaking apart that sticky rice, incorporating it all into the cooked kimchi and ingredients. Do your best to break apart each chunk of white rice; you don’t want chunks in the fried rice. The long-grain rice would make this process easier, I guess. 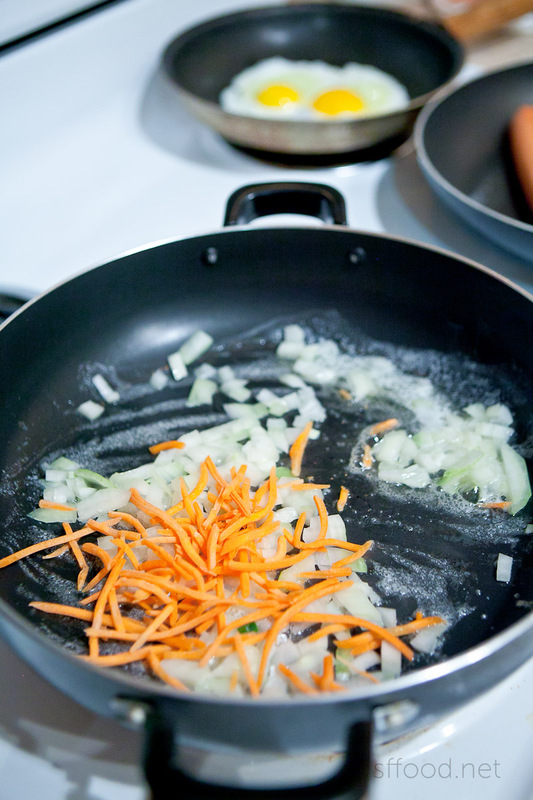 Take care to not burn the bottom while you’re doing this — which is why I use a nonstick frypan for this dish. After 4-5 minutes of breaking apart rice chunks and stirring, you’ll end up with a perfectly red kimchi fried rice. IF YOU WANT, you can drizzle a little bit (1 tablespoon or less) of sesame oil into the mixture and stir in. Putting in sesame oil at this point prevents the kimchi taste from overtaking the nice aromas of sesame oil, and it’ll also provide a nice glistening effect to the dish. That said, I didn’t use sesame oil on this day because I used enough butter to not require it. The only thing left to do is toss and mix in your green onions. This is merely for some bright green/white color and a little bit of freshness in the kimchi fried rice, since everything else was totally cooked through. While the kimchi fried rice was being cooked, I made some sunny side up eggs in a separate pan. This is basically just for appearance; the dish tastes perfectly fine on its own, and it also taste just as great with a nicely fried egg on top or scrambled eggs on the side. But this dish and eggs go perfectly together. Plate the rice into a bowl or plate. You can easily take rice and push it into bowl to flip over in a nice dome shape onto a plate, or in this case, I just scooped some into bowl, and topped with an egg. As a garnish, I put some additional pepper with unroasted sesame seeds, and sliced some serrano peppers. Nobody like serranos as much as I do — but not everyone can handle the spice, or else I’d have put this into the fried rice. On this day, I’m serving up with some fresh cucumbers, partially because I love cucumbers, and also because that’s what I had on hand! 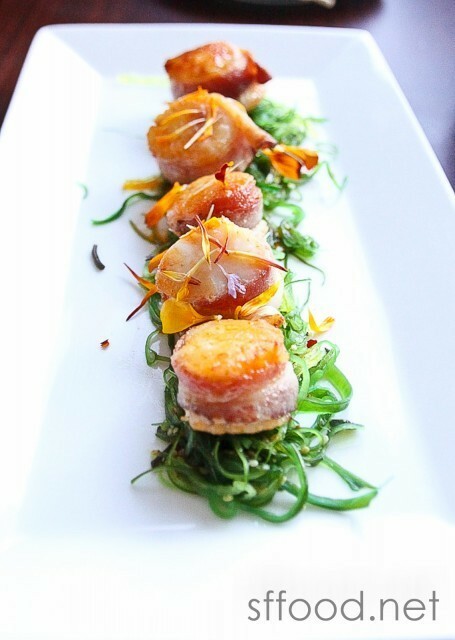 Like I said, this is all about using up your leftovers. If it’s something that be cooked, toss it in the kimchi fried rice; if it’s not — it’s garnish! 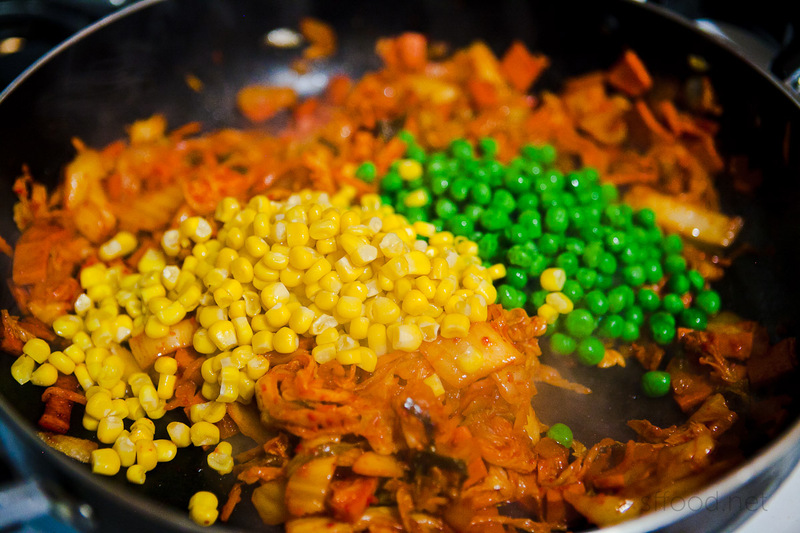 For a prettier plating, you can cook the corn and peas separately, and strategically place in the fried rice at this time instead of into the pan. Final plating of the kimchi fried rice! And this is just me attempting to take a photo of the spoon I’m holding with my Canon balancing on my shoulder. Just because I like shots of spoonfuls of anything. It’s a really easy to make dish that most people really enjoy — and you can also adjust the level of spiciness depending on who you’re cooking for. Kimchi fried rice is also the ideal way to get rid of many leftovers in one shot, cleaning out the fridge. If you cook a lot, you inevitably end up with bits of this and that — and nothing is better for using it all up than this. On this evening, I cooked up some Polish sausage and served the kimchi fried rice with that, but also wonderful is when you make quick seaweed soup or have some beef bone soup alongside this easy dish. The mild soup with the red hot rice always makes a nice food partnership. If you have any questions, let me know in the comments below! 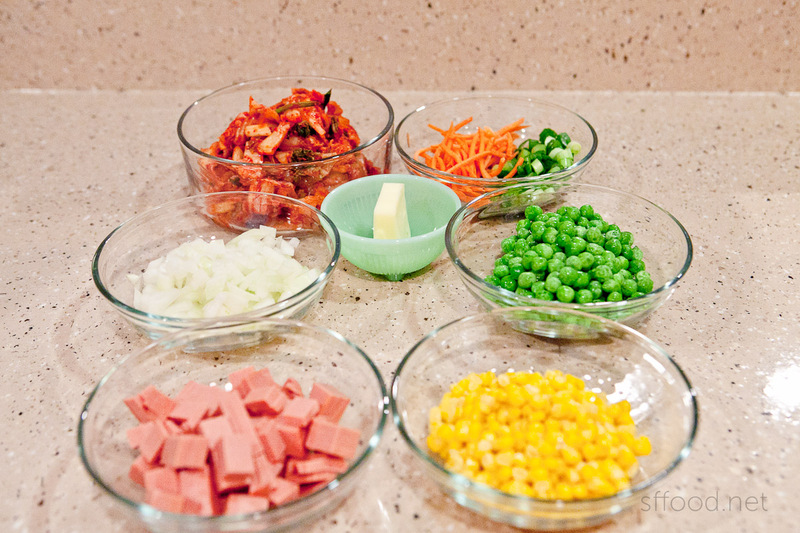 Otherwise, enjoy making some kimchi fried rice! Yeah, I know. I dunno what made me want to buy that haha. Oscar Mayer just reminds me of childhood and I got nostalgic?